MEF SDN/NFV is positioned as a professional level, specialization certification within the MEF Professional Certification Framework. For the MEF-SDN/NFV Detailed Overview click here. Delivery: Delivered electronically via secure login, on-site proctoring by qualified proctor or through remote proctor. 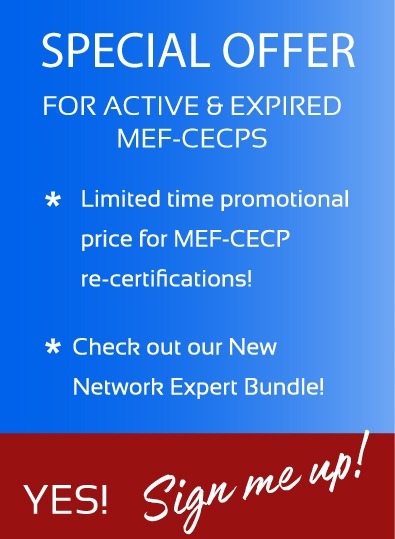 Credential Awarded: MEF-SDN/NFV Certified Professional (MEF-SDN/NFV) upon passing the exam. Valid for 3 years. Re-Certification: Within three years of certification, prior to certificate expiration. Operator-level understanding of SDN and NFV, sufficient to demonstrate mastery of the design, installation/deployment and management of complex SDN and NFV networks. The breadth of SDN and NFV skills necessary to address all the facets of advanced networking, vendor-neutral information that an IT technical professional needs to know (networking, virtualization in many forms), as well as the knowledge to plan, install, and operate advanced SDN and NFV networks) across a wide variety of network architectures. Domains include Planning, Building, and Operating SDN and NFV networks, with knowledge of architecture, testing, solution design, security, as well as metrics and management of a deployed SDN/NFV solution. Training & Study Available: Several MEF Accredited Training Providers (MEF-ATP’s) will be offering training soon. Click here for details on our Accredited Training Providers. Next Steps: Begin your journey to mastery by learning SDN and NFV, and transform your own career today. You’ll be glad you did!